Talky, tedious and preposterous, Underworld: Dud Bores is the fifth entry into the franchise about warring vampires and werewolves – like Twilight with better acting. I could tell you that it’s so bad it makes Blade look like Blade Runner; that the shockingly cheap special effects appear to have been made on Windows 95; and that if I spent the next 24 hours repeatedly hitting my head against a wall I would incur less damage to my brain than I sustained by seeing this movie. But I’ll spare you all that, and instead review the Oreo milkshake I had while watching. Though advertised with Oreos atop the milkshake as above, they were mysteriously missing, along with all the female characters’ clothes. On the plus side, there were bits of Oreo spread all the way through the shake, so you keep discovering satisfying clumps of chocolate and wondering how they got there – a bit like Charles Dance in this movie. The golden vanilla colour was much more pleasant than the film’s dull blue hue designed to cover up just how bad it looked, and the milkshake almost matched the movie in terms of thickness. A major problem was the drink’s sickly taste, but fortunately it comes in a handy plastic cup in case you need to be sick. 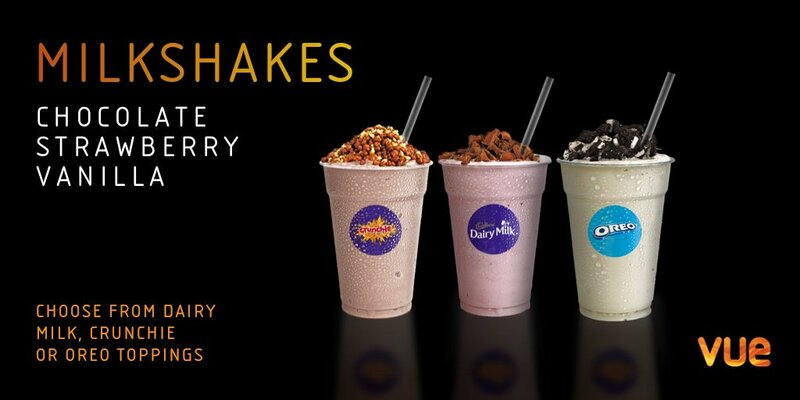 The shake was as overpriced as anything in Vue, though you can easily recoup some of the cost by taking as many free straws as you can stuff in your trousers without the staff noticing. Overall I would give this milkshake three stars, as it was just cold enough to cause a level of brain freeze that numbed me to much of the film. Would recommend – please don’t put that on the poster.